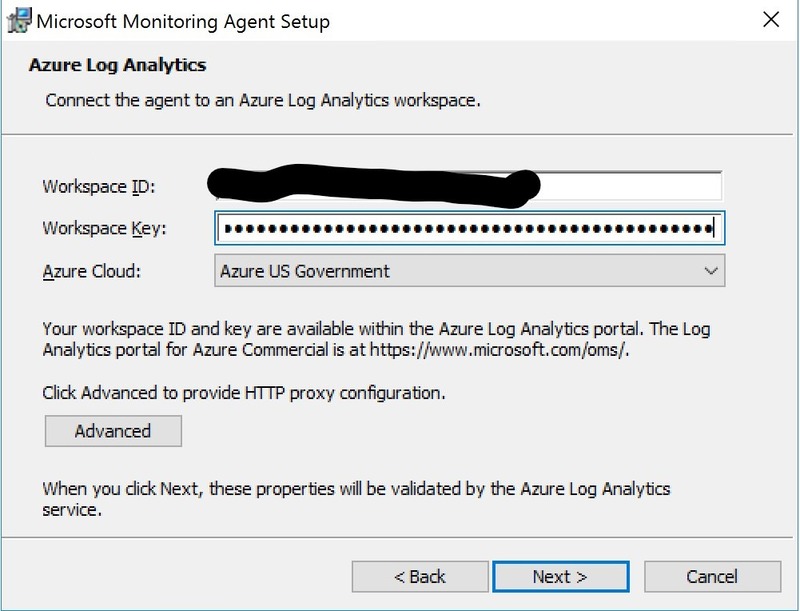 In this blog post i am going to walk you through the steps to setup Azure Monitor logs aka OMS, aka Azure Log Analytics with System Center Configuration Manager (Current Branch). I wont go into the details of what Azure Monitor is but the premise is that it collects and analyzes data of your cloud and on premises environments to ensure your applications and systems are performing to their peak and surfaces potential issues before you suspect them. For an overview of Azure Monitor Logs check out our docs located here. 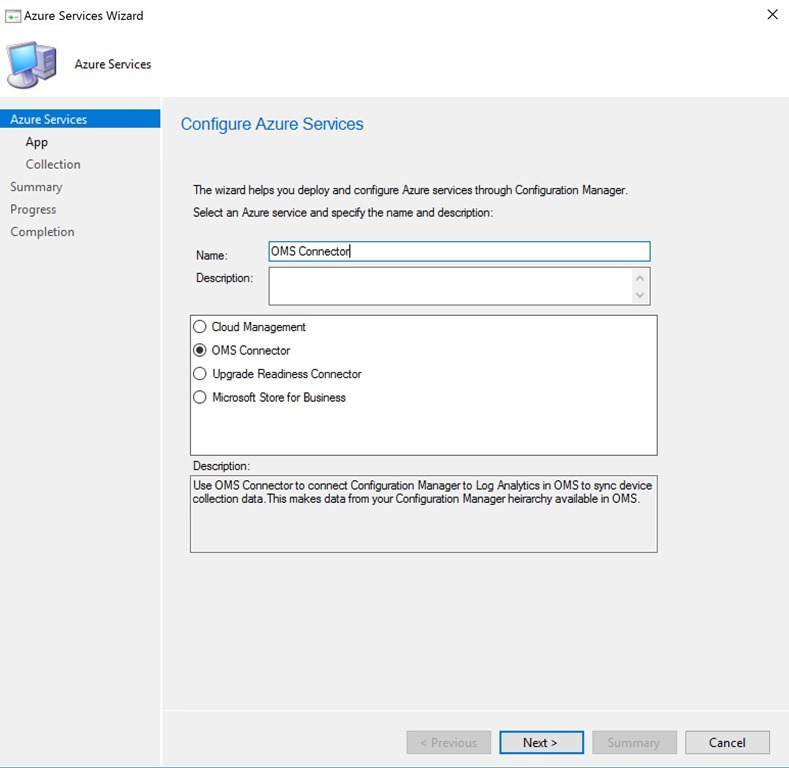 First login to your Azure subscription and then go to Azure Active Directory and App Registrations to create a new Web App/API for use in Configuration Manager. Click on New application registration. Fill in the Name, Application Type and Sing on URL fields and click Create. Select settings to create a secret key for use with Configuration Manager. Select Keys and then fill in the Description and Expires fields and then click save to generate the Key. Ensure to write down the key as this is not accessible after you leave this screen. 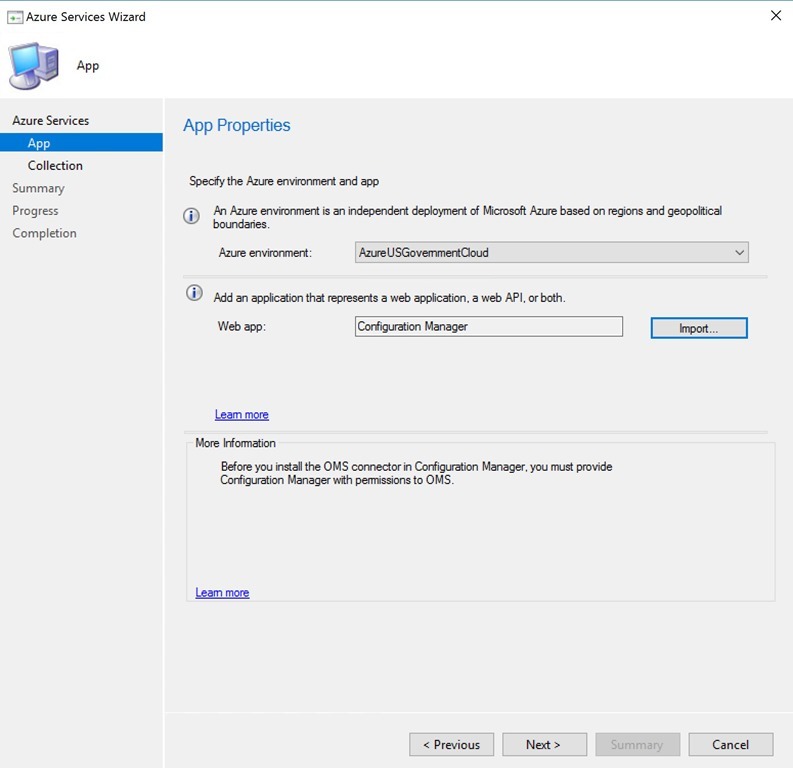 Additionally copy the App ID URI and the Application ID referred to as the (Client ID) later on as that will be required when creating the OMS Connector in Configuration Manager. Now we need to go to Resource Groups and select the RG we are using and ensure the Contributor role is specified for the WebApp we just created. 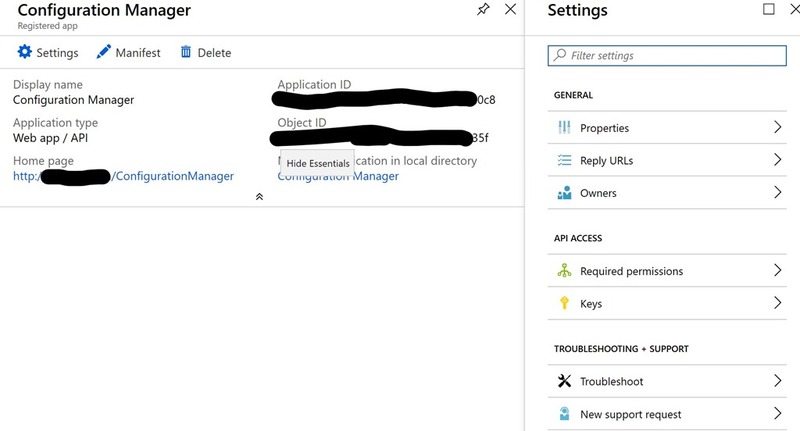 If not you will not be able to see the RG in the OMS Connector setup in Configuration Manager. Go to Resources Groups > YourRG > Access Control (IAM) and then Role Assignments and then add role assignment. Specify Contributor and your WebApp and select save. Next lets create a Log Analytics Workspace if one does not already exist. 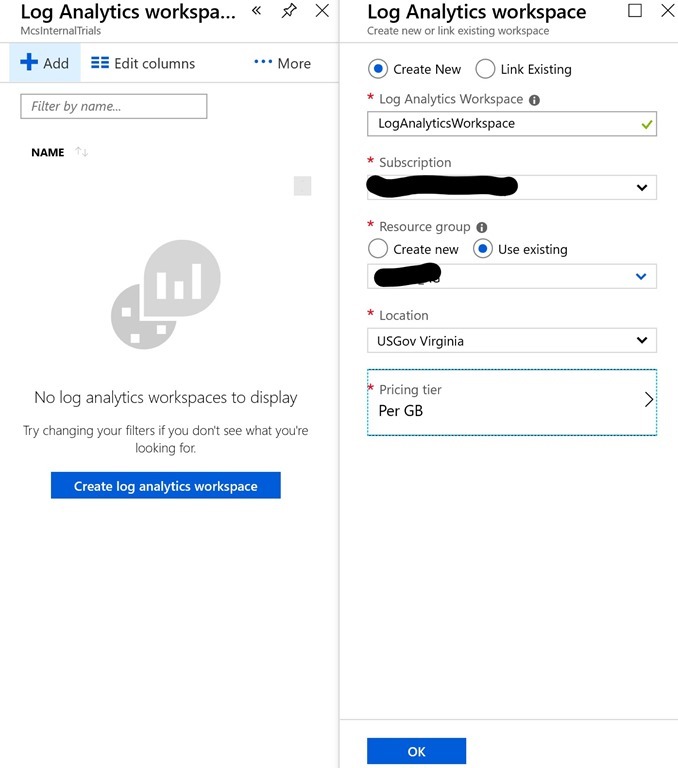 Go to All Resources in the azure portal and search for “Log Analytics workspaces” and select Add. 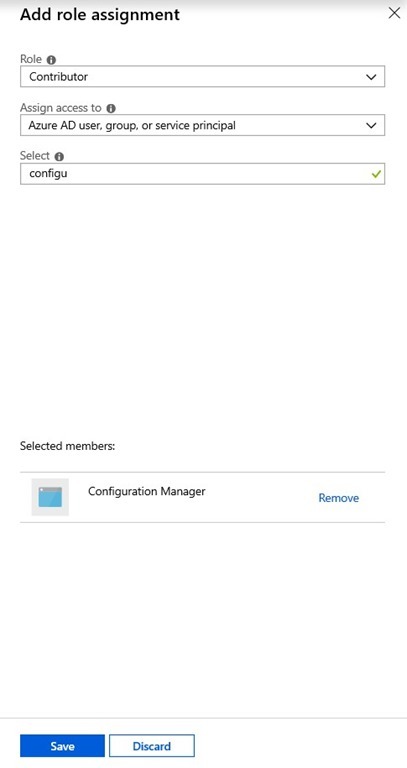 Select Add and then provide a name, Resource Group, Location and Select ok.
Now select Add > Add role assignment then add the Contributor role and select your Wep App/API and select save. 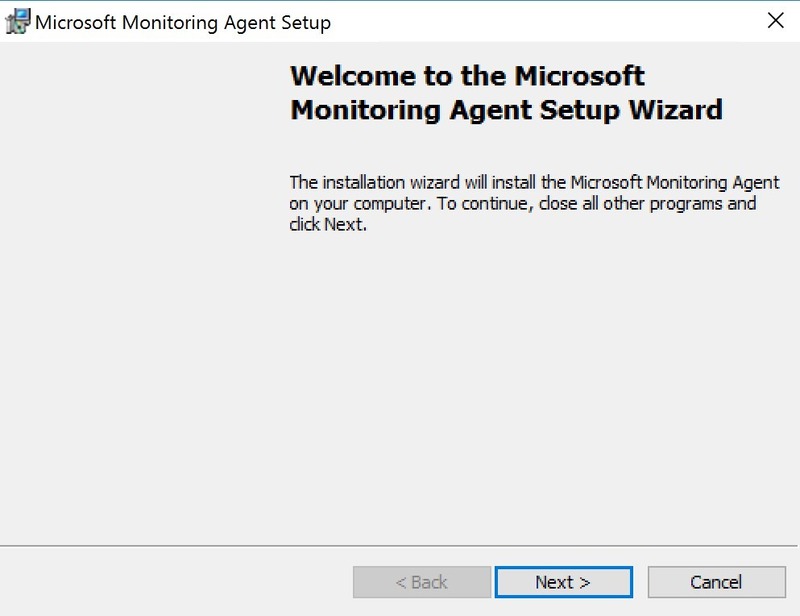 Next we need to configure the Microsoft Monitoring Agent to send data to Azure here is a great link for detailed steps. Run the MMA Setup and click next. Confirm Installation location and click next. 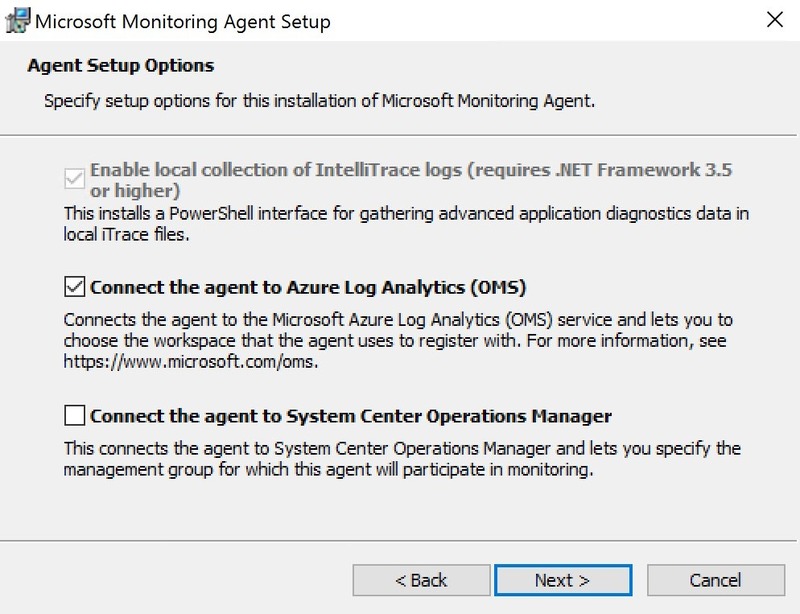 On the Agent Setup options screen select “Connect the agent to Azure Log Analytics (OMS)” and click Next. Configure your workspace information and select next. 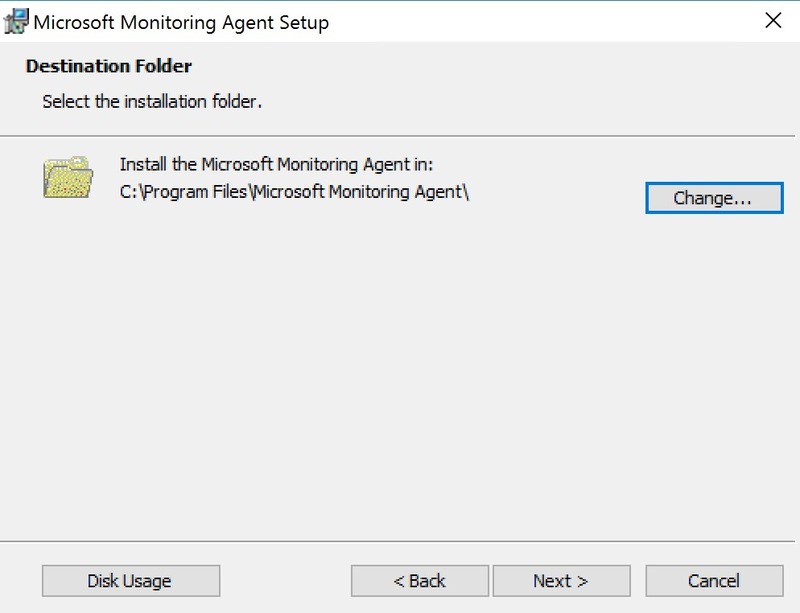 Confirm installation options and select Install. Review competition and click Finish. 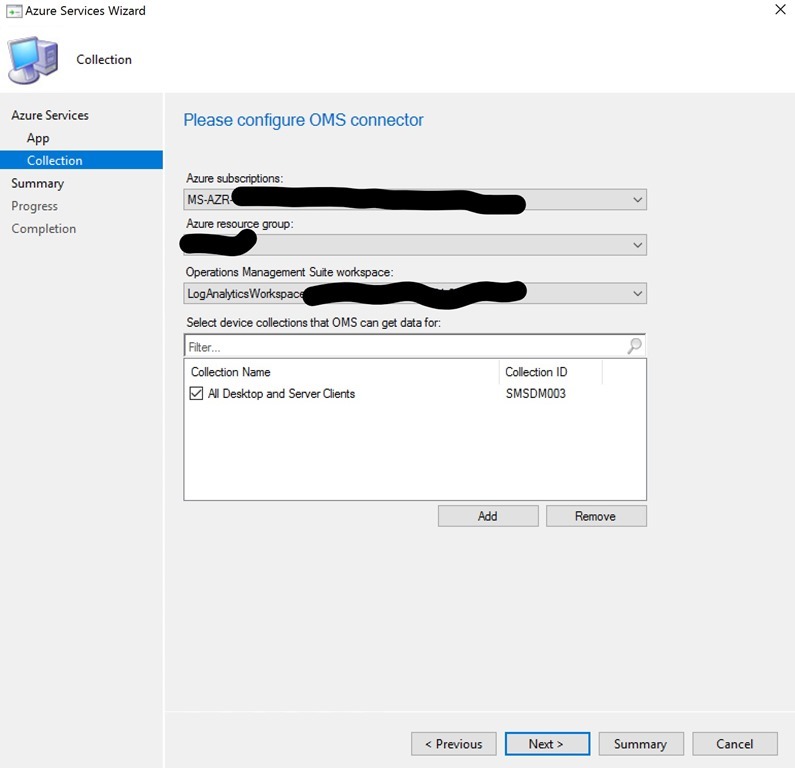 Select OMS Connector and provide a name and then click next. Fill in the Web App Properties and select Next. Client ID: is the Application ID Referenced earlier in WebApp creation. Secret Key: Referenced earlier in the WebApp creation. 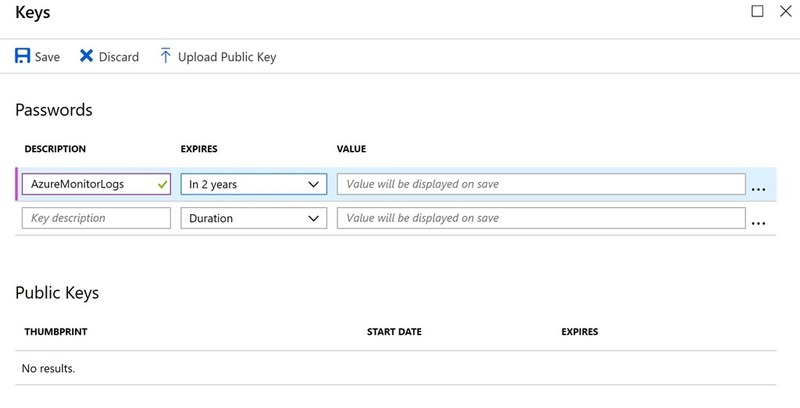 Secret Key Expiry: Referenced earlier in the WebApp creation. App ID URI: Referenced earlier in the WebApp creation. Select your subscription, resource group, and workspace then add any collections you want to monitor and the click next. Confirm selections and click Next. Verify Completion and select close. 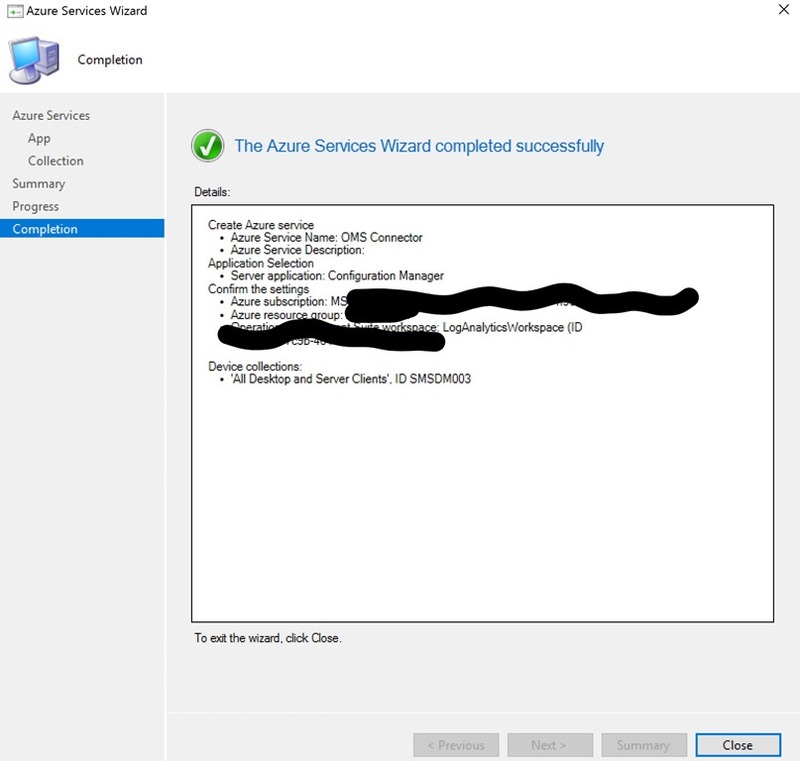 Now we can configure Azure Monitor Logs to pull in Configuration Manager collections. 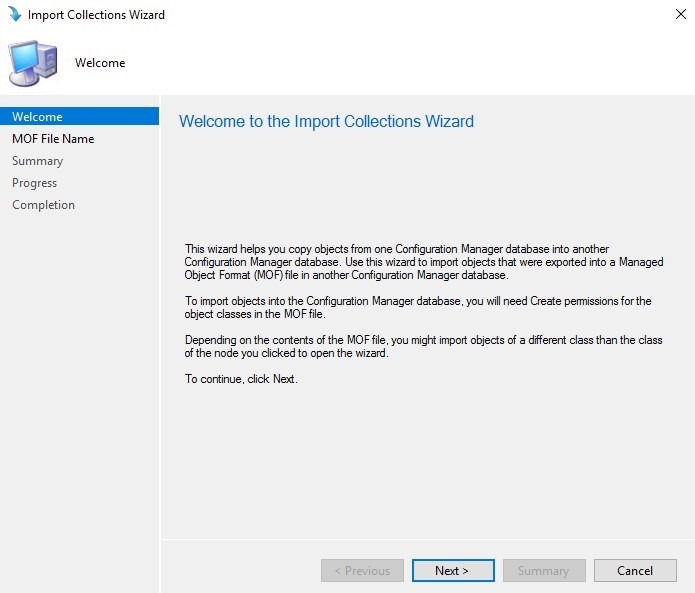 Go to your Log Analytics Workspace and select Advanced Settings > Computer Groups > SCCM and Check the box to “Import Configuration Manager collection memberships” and then select save. 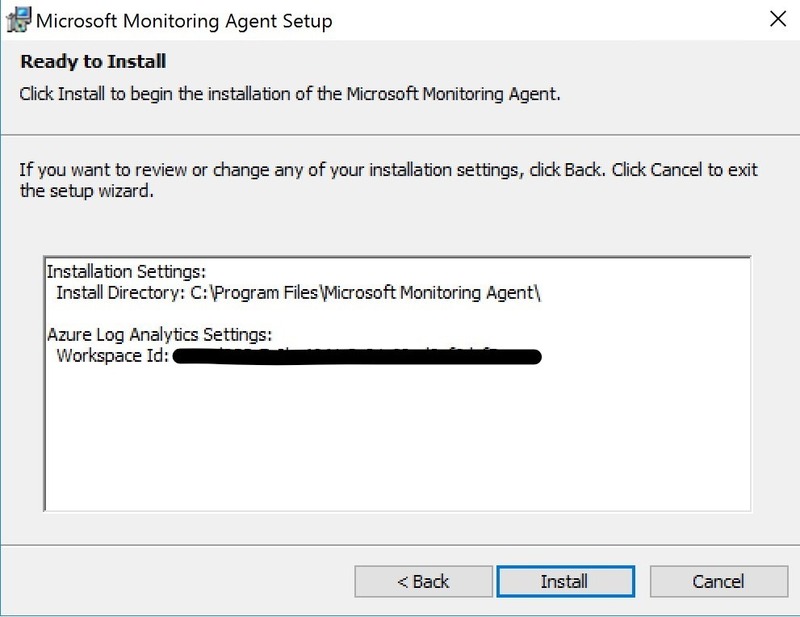 I hope this helps some get their feet wet with Azure Monitor Logs Integration within Configuration Manager. A follow up post will go over some basic Log querying and collection creation based on derived data from Azure Monitor Logs. So to break this down quickly CM updates process via the SMS_DMP_Downloader Component so the perfect place to start would be the dmpdownloader.log file. As you can see below the log clearly states the reason for the issue. “The site is under offline mode”. So if your scratching your head and wondering what that means its pretty simple. 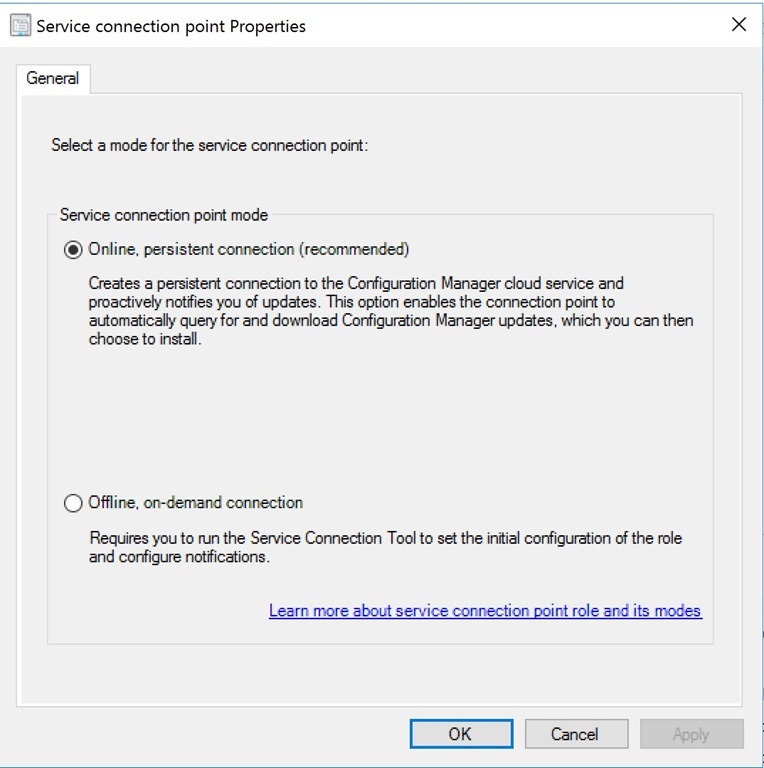 In order to get in console updates you have to have a Service Connection Point installed and set to online mode like the below screenshot. 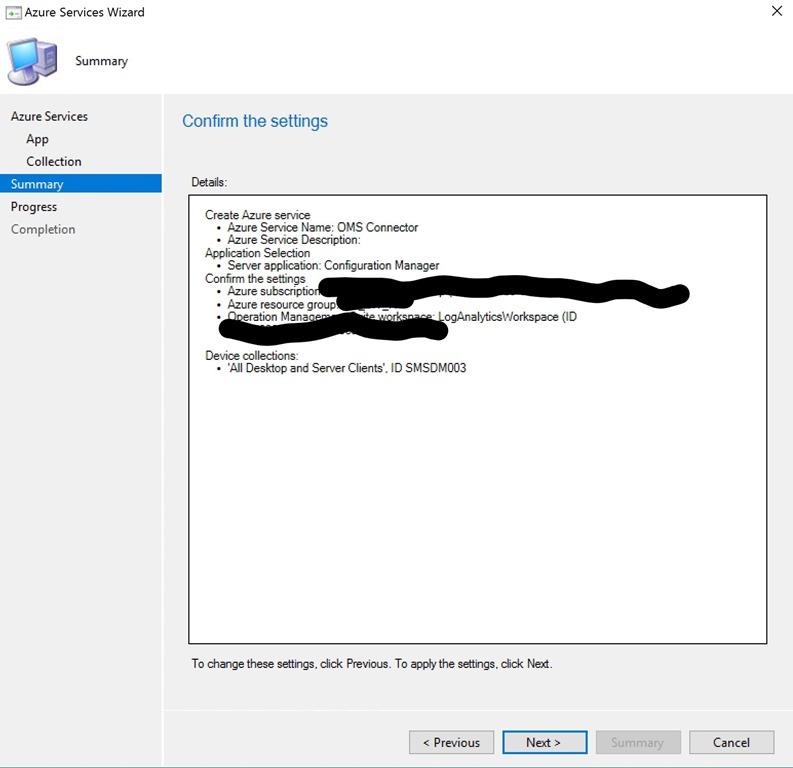 You can view the status of your SCP by opening the ConfigMgr Console and navigating to “\Administration\Overview\Site Configuration\Servers and Site System Roles” and viewing properties on the Service Connection Point. Why would my site be in offline mode you might ask? Well one legitimate reason is if you support an offline environment and need to provide updates to it, if thats the case you need to set your site in offline mode prior to running the Service Connection Tool to upload your telemetry data. Once your done this process you should immediately turn the SCP back to online mode. If this was not your issue you could check “D:\ConfigMgr\CMUStaging\ApplicabilityChecks” and see if your update shows in this folder if not check the “<CM Installation Directory>\CMUStaging\Manifest.xml” File to see if the update shows there. 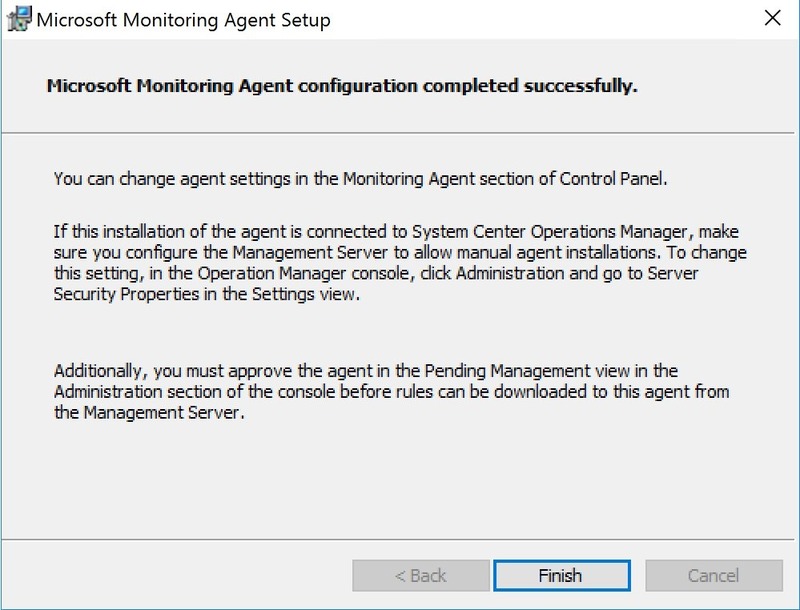 If it does not i would restart the SMS_DMP_Downloader component by going to “\Monitoring\Overview\System Status\Site Status” in the ConfigMgr Console and right clicking your site server and selecting Start –> Configuration Manager Service Manager. Find the Component you want to stop select query, stop, query , start. At this point if you are still stuck id verify you indeed have an SCP installed and set to Online mode and i would engage your local firewall or proxy server team to do some captures and look for any dropped traffic. If this turns up nothing i would open a CSS ticket with Microsoft to investigate further. Happy New Year everyone i know only like 11 days late to the party but better late than never so here’s a quick nugget to start the new year for you all. 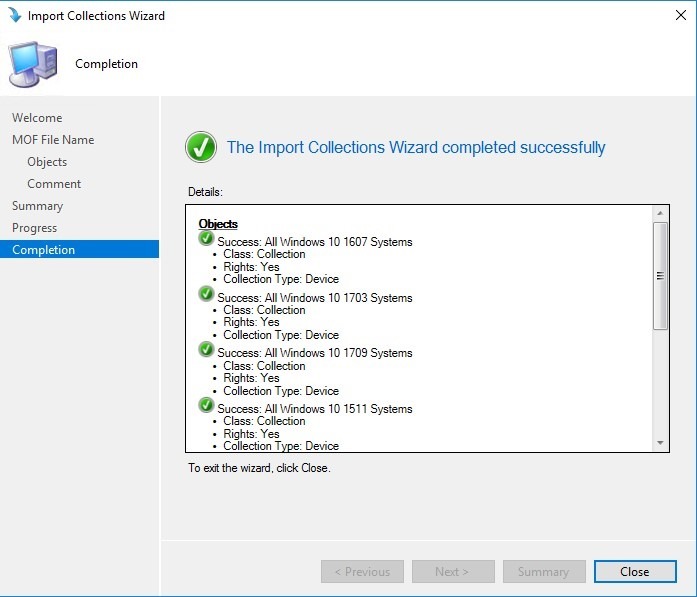 Just a quick set of collections for Windows 10 and Server 2016 and 2019 to get you going for the year. Below are the steps to import for anyone that needs them and hope this helps someone out there. 1. 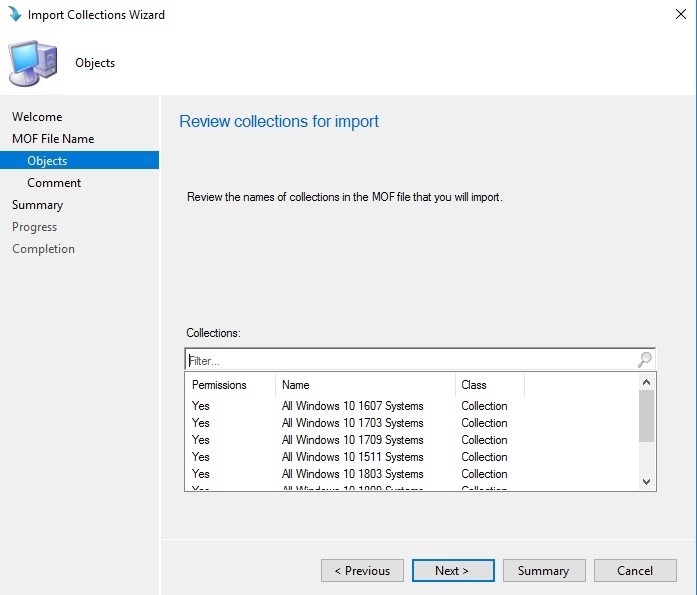 First download the Collections from this link and then open the ConfigMgr console and right click on the Device Collections and select “Import Collections”. 3. Select the previously downloaded mof file and then click Next. 4. Review collections to import and select Next 3 times or summary. 5. Verify the collections imported and click close. 6. You should now have the following collections created and populated with the appropriate releases in your environment. Today i am going to share a Configuration Baseline to extend ConfigMgr Hardware inventory to report Bitlocker status as well as Hard Drive Media Type. This is extremely useful with the latest hardware encryption vulnerability being exploited in Bitlocker. See https://www.engadget.com/2018/11/06/microsofts-bitlocker-compromised-by-bad-ssd-encryption/ for additional details on this issue. First we are going to download and import the Bitlocker Extended Inventory configuration baseline into your ConfigMgr Hierarchy. Select Add and then browse to the “Bitlocker Extended Inventory.cab” file downloaded previously and select open. 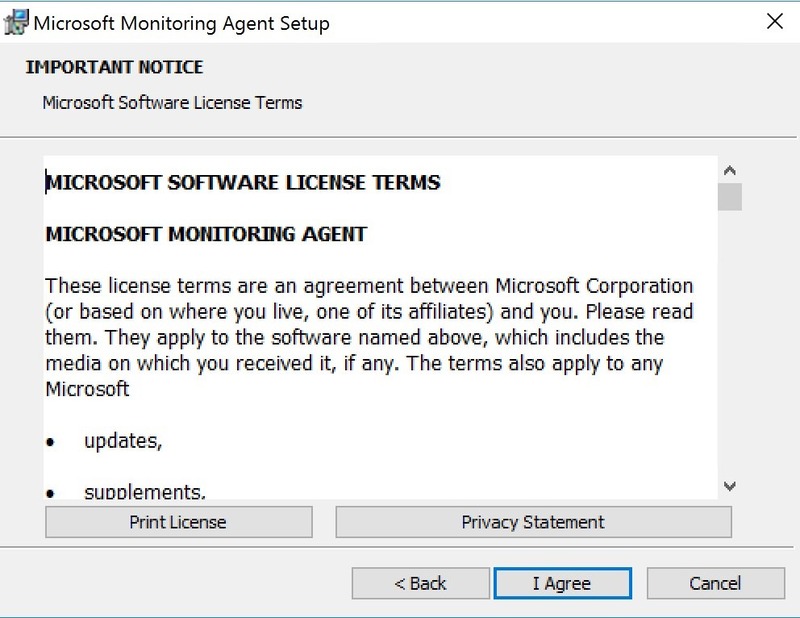 Click Yes on the publisher warning and Next twice to complete the import process. Deploy the Baseline to all workstations you want to extend inventory on. 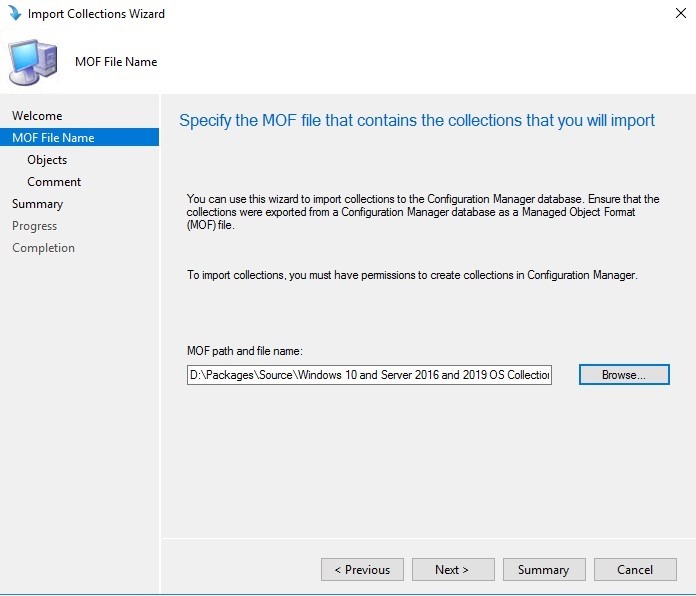 Next we will Extend ConfigMgr Hardware Inventory to collect the newly added WMI Class. I typically advise against modifying the “Default Client Settings” but to add WMI classes directly via the gui vs with a mof you need to edit this one. Select “Add…” from the Hardware Inventory Classes screen. Click connect and then enter a computer name that has been extended via the previous baseline deployment and then click connect. Check the box next to BitlockerExtended and select OK twice. The rest is up to you go save the world! Here is some TSQL to get you going on creating your own SSRS Report or Dashboards to track. If you view Resource Explorer on one of your extended clients you’ll notice a new class “Bitlocker Extended“. This information can be used to review the Disk Model and Disk Type information to see if one of your disks is affected by the hardware exploit. Additionally the Encryption Method column will show if Hardware Encryption is being used or not. The baseline is great to get the class created on clients and ensure all of your devices are compliant with having this extension but if you want to get regular updates on this data you’ll want to push the remediation script out independently as a standalone package or via the Run Scripts action. For extra credit you could also modify the Discovery script to trigger off of class existence as well as baseline last evaluation time -x days. Hope this helps someone and while the code appears to be reporting properly in my customers environment your mileage may very so please test as usual.